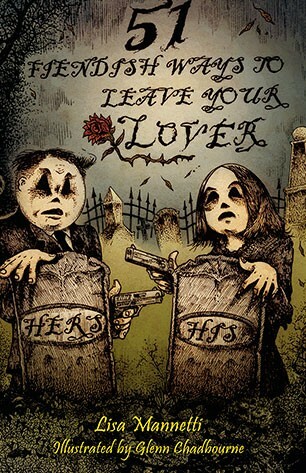 If you prefer your vengeance served scalding hot with a side order of steaming gore "51 Fiendish Ways to Leave Your Lover" is the how-to guide you’ve been waiting for. Come on now. Vengeance has fueled some of the greatest plots in classic literature. Why should reality be any different? Why hold back? Let’s face it – the world is full of ex-lovers, current lovers and soon-to-be-ex-lovers who soooo have it coming to them. Now you can spice your life up with a generous helping of venom, and forget all that “living well is the best revenge” malarkey. Revenge is the best revenge. Bram Stoker Award-winning author Lisa Mannetti’s hilarious guidebook (replete with helpful illustrations by the celebrated artist Glen Chadbourne) will walk you – step by step – through the ghoulishly delicious process of getting over, getting on and getting even. What a marvelous blend of humor and horror, offering several ways to end a relationship that Paul Simon never thought of. "Do you like sick, bitter, twisted humor? Boy, have I got a book for you – 51 Fiendish Ways to Leave Your Lover is hilariously frightful and frightfully hilarious!" --Robert Dunbar, author of "Martyrs & Monsters"